ViDA, the Spanish word for "life"
KVDA, virtual channel 60 (UHF digital channel 38), is a Telemundo owned-and-operated television station licensed to San Antonio, Texas, United States. The station is owned by the NBC Owned Television Stations subsidiary of NBCUniversal (itself a subsidiary of Comcast). KVDA's studios are located on San Pedro Avenue, near the North Shearer Hills neighborhood on the northern side of San Antonio, and its transmitter is located off of Route 181 in northwest Wilson County (northeast of Elmendorf). On cable, the station is available on Charter Spectrum channel 17, Grande Communications channel 6, and AT&T U-verse channel 60. KVDA logo, used until 2012. 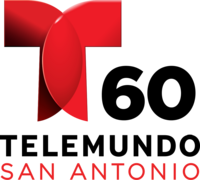 The station first signed on the air on September 10, 1989; KVDA has been with Telemundo since the station's sign-on, founded by the network as an owned-and-operated station. On May 1, 2009, ZGS Communications took over the operations of KVDA and its Fresno, California sister station KNSO under time brokerage agreements, though NBCUniversal retained the licenses to both stations. After the 2016–2017 FCC TV spectrum auction, KVDA will need to move from RF channel 38 to RF channel 15 for testing starting in March 2020. The switch is to be complete by May 1, 2020. KVDA discontinued regular programming on its analog signal, over UHF channel 60, on June 12, 2009, the official date in which full-power television stations in the United States transitioned from analog to digital broadcasts under federal mandate. The station's digital signal remained on its pre-transition UHF channel 38, using PSIP to display the station's virtual channel as its former UHF analog channel 60, which was among the high band UHF channels (52-69) that were removed from broadcasting use as a result of the transition. KVDA broadcasts seven hours of locally produced newscasts each week (with one hour each on weekdays, Saturdays and Sundays). Telemundo formed a news department for KVDA prior to the station's official sign-on; local newscasts debuted on channel 60 the day the station began operations on September 10, 1989, with the launch of newscasts at 5:00 and 10:00 p.m., under the title Noticiero 60. Within one ratings period, the station was challenging Univision owned-and-operated station KWEX-TV (channel 41) for the position of the top-rated Spanish-language station, which KWEX had held for almost 30 years. In 2007, NBC Universal announced it would reduce budgets company-wide, including its Telemundo owned-and-operated station; as part of the cuts, KVDA shut down its news department and replaced its in-house San Antonio-based newscasts with a regional newscast based in a new production center at Dallas sister station KXTX-TV. [citation needed] This move attracted criticism from the National Association of Hispanic Journalists, including formal statements against NBC Universal. On May 21, 2012, KVDA relaunched in-house news operations with the debut of half-hour evening newscasts at 5:00 and 10:00 p.m. on Mondays through Fridays, that are produced at the station's San Pedro Avenue studios; the locally produced newscasts have been broadcast in high definition from the news department's launch. ^ "On air". ZGS Communications. May 2009. Retrieved May 24, 2009. ^ FCC TV spectrum Phase Assignment Table, FCC Incentive Auction Television Transition Data Files, April 13, 2017. ^ "CDBS Print". fjallfoss.fcc.gov. Retrieved 2018-11-19. ^ KVDA in San Antonio to Launch Evening Newscasts, TVSpy, May 18, 2012. ^ Telemundo San Antonio lanza nuevo noticiero local, Hola Ciudad, May 17, 2012.